A core group at our yearly event, having worked with us for several years, and the first name on my list to re-book each year! Very professional, knowledgeable of their subject, friendly, accommodating and creative. They interact brilliantly with all members of the public, and the scope of their display is amazing, informing about all aspects of life in the time period. .
‘The Thegns team were a pleasure to work with. A professional group presenting high quality replica artefacts and demonstrations who thoroughly engaged our visitors.’ . The Thegns of Mercia helped us with research, social history, authentic costume and scenic elements during our Staffordshire Hoard festival in 2015. With 22 new plays, some performed in the round where every element of staging is subject to close scrutiny, it was useful to work with expert advisers like the Thegns of Mercia. . The Thegns of Mercia created a light-weight, replica Saxon shield and boss for children to handle during our educational workshops. The shield is beautifully designed and was reconstructed after extensive research by the Thegns in the Collections Department at the Trust. The shield is a very useful resource, enabling hands-on learning and vividly bringing the Saxon period to life. Super work! . 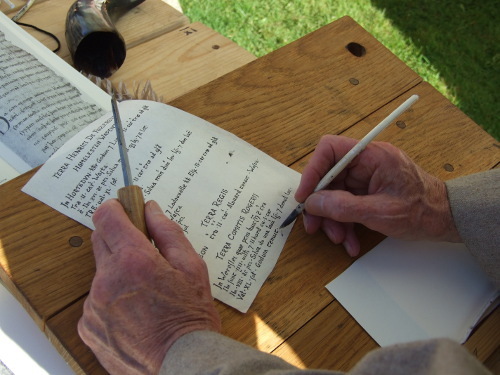 Opportunities to see the Thegns in action, bringing the Anglo-Saxon and 'Viking Age' to life at educational events across the Midlands and beyond. Check out the latest reconstruction projects our team of craftspeople have been working on, both for clients, and for our growing 'mobile museum' collection. To find out more about the Thegns, if you are interested in booking our team, or wish to discuss future events or projects, please do contact us.